Tonight I got to play Skype session #2 - a week later than originally planned, but a good time nonetheless. The first ten minutes were spent sorting out technical issues: audio static due to a bad mic and the inability to get both our videos working at the same time. After Tracy switched back to the mic he used previously, the audio was great - better than last time, actually, as we didn't incur any spottiness throughout the duration of the two-hour game. Since we only managed to achieve one-way video, we elected to go without. The video is nice, but not having it wasn't really a detriment - not for our two-player game, at least. We picked up outside the Sign of the Three Crowns, where Jendrick and Rosamund parted for the evening. They reconvened at sunrise in one of Sturnheim's gardens, though when Rosamund arrived, she was accompanied by Tregar, the dwarf hunter that Jendrick had spoken to the previous day. Rosamund had surmised that Poot's slaying was somehow related to Sturnheim's lost treasure, and wanted Jendrick and Tregar to help her uncover the truth. As the story goes, some forty years prior a caravan carrying a large segment of Sturnheim's wealth was plundered by unknown robbers, crippling the town and severing its trade with other nearby settlements. Shortly thereafter, a party of eight adventurers struck out to find the lost caravan. Four met an untimely death along the road; of the four that returned, two left Sturnheim and two remained in the village. Of those that remained, one supposedly went mad and eventually fled; the other was Poot. Rosamund was hesitant to place much trust in Sturnheim's militia, for its captain, Valdar, was the son of a warrior named Kesor, one of the surviving adventurers that departed and a notably evil man. As such, Jendrick led his friends to the constabulary where they inquired about the confiscated stone sword. The guards allowed them to examine it, though not remove it from the premises. When Jendrick asked if Poot's house might be searched, the men agreed, with one soldier accompanying the trio there personally. Meet me in the old alley tonight and bring the key. I have ascertained its origin and purpose, and the location of the lock. Rosamund passed the note to Jendrick, who promptly handed it over to the guard, much to the girl's displeasure. The trio then returned to the constabulary to question the jailed bandit, who revealed nothing. Back outside, Rosamund and Tregar surmised that the note may have been scribed by Valdar, which would implicate that Valdar himself had orchestrated Poot's slaying. With no further leads, and without possession of the "key" (the stone sword), the trio left town and began traveling along the Forsaken Road (the road that Poot had referenced in his dying words). After an hour, the friends encountered a mounted knight in rusted field plate armor; he carried a lance bearing a tattered blue pennant and sat upon a weathered nag. The knight, obviously a venerable man by his voice, proclaimed himself guardian of the road, refusing to let anyone pass until they bested him in a duel. Seeing that Jendrick rode no horse, the knight dismounted and drew forth his longsword. The two crossed steel, and after Jendrick twice scored hits between his opponent's armor, the old knight yielded and allowed the trio to pass. Jendrick offered the man his [magical] aid, treating him with the utmost respect and inquiring as to his origin. In the ensuing dialogue, Jendrick learned that the man was none other than Sir Nycklos of Roeh, the surviving adventurer who supposedly had fled, and indeed was quite mad (or at least very senile). The party pressed on, and as the afternoon waned came upon an unusual rock formation standing near the road. Jendrick noted that the boulders looked vaguely like a dragon, and Rosemund linked this to another of Poot's deathly phrases, "south at dragon." Before they could go further, a grunting noise behind the rocks revealed a hulking man devouring an uncooked squirrel, with the carcasses of several more at his feet. This man declared himself "Ahrne," and though his speech was rather primitive, he wore two most curious items: a stone shield, strapped to his back (his "armor") and a valuable gold necklace bearing a medallion branded "Sturnheim Caravan Company" and dated 46 years ago. Jendrick asked to be taken to the place where Ahrne found his strange treasures, and Ahrne readily agreed... for another squirrel. That's where we left it; though there wasn't much combat (the duel with Sir Nycklos hardly counts), the plot has definitely started to unfold. In addition, having a paladin as the lone PC creates an interesting dynamic in almost every NPC encounter. For example, a character of any other class would likely not have turned the note found in Poot's house over to the guard; Jendrick, however, chose to do just that, drawing scorn from Rosamund and arguably turning a valuable piece of information over to a questionable source. On the other hand, Jendrick's chivalrous demeanor served him well in the encounter with Sir Nycklos, and has helped him establish a valorous repor with numerous individuals in Sturnheim. Looking forward to seeing how the rest of the adventure plays out, and particularly what companions Jendrick brings with him when finally he arrives in Hommlet. I stumbled across this post while poking around on Dragonsfoot the other day, and really enjoyed it. The author created a one-off scenario where a band of ogres had been terrorizing a halfling shire, and the lone player controlled a party of ten 1st-level halflings to track down and eliminate the threat. This was a B/X (D&D Basic) adventure, so the halflings were just halflings. In any case, the author goes on to provide specific stats for each of the ten hin (along with starting money and equipment) along with the individuals' roles within the village. Then he recaps the encounter itself, recounting every die roll and tactical decision made by both sides. I found the whole piece to be highly entertaining and fascinating in its elegance and simplicity. For a while I've felt like Basic (or something in the realm of "not-quite-Basic," like the Basic Fantasy RPG) is something I could really get into someday, under the right set of circumstances. Every time I read something like this it just reinforces that notion. VoIP may forever change the way I play D&D. A good friend and I got together this evening to play a quick OSRIC session using Skype. He already uses video and voice for gaming regularly, but for me, this was a first-time experience. It practically couldn't have gone more smoothly. The main purpose of the adventure was to acclimate Tracy's new character, a paladin named Jendrick Tannerson (son of a tanner - fitting) to the campaign in place of Greenleaf the druid (now officially retired). Though we only ended up playing for about an hour and a half, much was accomplished. We're planning to reconvene Sunday evening, and I could see it taking three to four of these brief, online sessions to wrap up Jendrick's inaugural adventure, which should have him ready to join the rest of the tabletop cast in Hommlet, the next time we play. The module we're using for our online foray is Fighter's Challenge, modified to fit within the ongoing campaign. Jendrick, traveling the countryside in search of personal enlightenment and general do-gooding, made his way to Sturnheim and befriended a lovely young lady named Rosamund, who instantly became enamored with the budding knight. Jendrick, naive in the ways of romance, graced her with awkward conversation in the Sign of the Three Crowns (the local inn), and also parleyed with Tregar, a young dwarven hunter newly returned from guard duty for a local caravan. Jendrick offered his services freely to Tregar on his next hunt (for which Tregar intends to depart in two days' time) and was quickly obliged. Later in the evening, Jendrick and Rosamund happened within earshot of a scuffle in a dark alley while walking the streets of the village, with Jendrick rushing to the aid of an old man who seemingly was being attacked by three others. The assailants fled and Jendrick pursued, weighted down by his mail and only able to keep pace with the slowest of the bandits, that one lugging along a heavy greatsword that appeared to be made of stone. Jendrick managed to catch and pin the man, and Rosamund summoned a trio of the town's militia. "My house... parchment... sword is the key. Forsaken Road through hills... south at dragon." That's where we left it. The session was a blast, brief though it was. AD&D/OSRIC continues to impress me in all its nostalgic elegance. When chasing down the bandit, Jendrick's initiative bested the pursuant by four segments, allowing Jendrick to close the thirty-foot distance between them and make an attack roll to trip the bandit with his shield. A minor Strength test to pin the man; a Strength check to maintain the hold until the guards arrived. Even better was being able to play via Skype, using both video and voice. Tracy has amazingly good attendance for our tabletop sessions despite living more than an hour and a half away; that said, making the drive up for an hour or two of solo gaming isn't a reasonable expectation for anyone. Aside from a few audio glitches that forced us to reconnect (took all of 30 seconds), it was just like having him in the room. We used the honor system for die-rolling, but even if I'd wanted validation we could easily have used an online roller. Also nice was having my laptop - and all my notes and resources - right at my fingertips. I intentionally don't use a computer when gaming in person, but as it's nearly unavoidable for remote play, I was happy to have it. Dropbox and Skype file transfer make sharing character sheets instantaneous and trivial. As we were wrapping up, we also took a few minutes to check out Dabbleboard, a potential all-in-one solution for online D&D: it provides a fast and easy-to-use whiteboard for diagrams and maps, along with free audio, video, and chat for up to 20 people via tokbox. "Death seems to follow you, adventurers. Perhaps you'd have done better to let restful bodies lie, for now WE will be forced to finish the work that you've started to ensure the lasting safety of this village." Gulwar stepped outside and followed the foursome toward the traders establishment, though once there he found only the warriors. Unable to hear their conversation without compromising his identity, he waded out to the northernmost farmhouses until he located the farmer. To the farmer and his family he solemnly apologized for any distress he and his companions may have caused, and offered them a few gold coins. Obviously torn, the farmer admitted that Zert and Turuko had paid him off (only a few silvers) to go along with their story and serve as their witness. Armed with this new information, Gulwar gathered Rylin and Greenleaf (who in the meantime had taken it upon himself to bury the disembodied head of his player's former character) and visited Canon Terjon at the church of St. Cuthbert. The canon was distraught to learn that the bodies may have been stolen from the church's mausoleum, and bade the PCs to uncover the truth behind Zert's accusations. The village elder, too, supported the PCs in the name of upholding the church and extinguishing any potential for widespread panic or uprising in Hommlet. So, at this point, the PCs are really itching to locate Zert and his new allies, who curiously haven't been seen since Gulwar observed them at the traders establishment. Back at the inn, Rylin uses inside resources to locate Zert and Turuko's rooms, and the party sneaks upstairs to infiltrate both. The rooms are completely cleaned out, with no personal effects remaining. Ostler (the innkeeper) didn't know that either of them were leaving, though as their dues have been paid for several weeks in advance, to him it hardly matters. Seeing no sign of their accusers above ground, the party quickly descended to the dungeon level, then down the chute to the [now empty] ghouls' chamber. They forged ahead into unknown corridors, and all was going smoothly until they stumbled upon a room brooding with dog-faced gnolls. A melee ensued, and though the PCs (outnumbered more than two to one) managed to gain a quick upper hand, Greenleaf made the untimely mistake of dispelling his magic entanglement upon the enemies, and the gnolls captured Rylin and the druid, while Gulwar remained hidden under his cloak of elvenkind and Spugnoir fled. The gnolls marched the captives down another corridor, past a series of human guards wearing black armor that bore the yellow-eye insignia, and up to a dark-haired man adorned with a staff and mace who was obviously their leader (all the enemies referred to him as "Master"). The master offered Rylin and Greenleaf their lives in exchange for their indefinite service, and the pair reluctantly agreed (for the other option was death). Gulwar, still concealed, located Spugnoir and attempted to exit back up the chute, only to find it closed and barricaded. With some effort, the pair managed to circumvent a single human guard and discover an alternate way out: a tunnel under the moat that exhaled into a rocky outcropping above ground, a quarter-mile disposed from the moat house proper. Not much: one gnoll defeated, and three vials of holy water, an unknown potion, and an unknown clerical scroll returned to the village safely (not to mention just one out of three characters). I'm not planning to disposition experience for this session; I'll just lump the above in next time around. I'm still waiting for the group to have a break-out adventure both in terms of in-game success and experience earned (which tend to go hand-in-hand), and don't plan to reevaluate the AD&D experience system until at least after we're done playing the module - it's too hard to make a fair assessment with so much still left unresolved. Had the gnolls not preferred capture over the outright slaying of the PCs, the characters would probably all be dead. The party needs more firepower. It's interesting to note the change in dynamic since the campaign started with regards to NPCs available for hire. At the onset, Hommlet was enjoying an influx of adventurers and mercenaries in response to hearsay of local bandits, so much that the PCs were actually being approached by individuals looking for work. Weeks later, the bandits are gone, and many have died or been grievously injured since the adventuring population became saturated. Now, the remaining characters have few places to look for help. 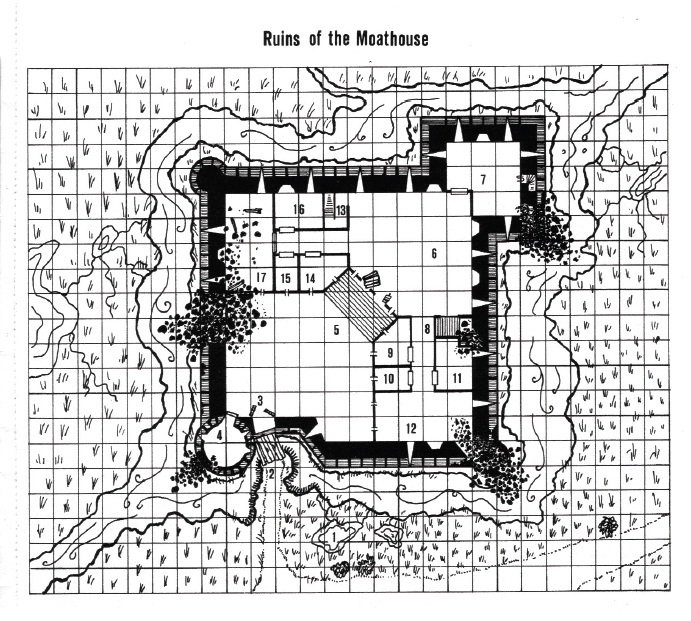 My gut feeling is that our next session will write the end to the party's chapter in Hommlet. The urgency of the PCs' situation is suddenly very much increased, with two characters held captive and the realization that a substantial evil force has taken up residence below the ruins. 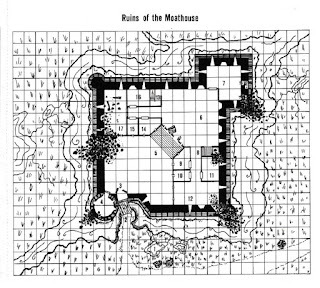 The party will need careful planning, men-at-arms, and the resources of the village to rescue their friends and close the door on the moat house for good. Surprise (d6): 1 = surprised for one segment; 2 = surprised for two segments; 3-6 = not surprised. Dexterity can negate surprise segments for individual characters. Attacking into Melee: If an attacker has multiple adjacent opponents, the target is determined randomly. The same applies when attacking at range against "engaged" opponents. Charge: A charging character gains +2 to hit, but if the defender's weapon is longer than the attacker's, the defender can attack first. A character can only "charge" once/10 rounds. Fleeing: Fleeing characters immediately draw an additional attack from adjacent opponents at +4 to hit. Parrying: A character who parries cannot attack, but may subtract his or her "to hit" bonus from his or her opponent's attack roll. Invisible Opponent: An invisible opponent can only be attacked if the general location is known, and the attack is at –4 to hit. Prone Opponent: Attacks against a prone opponent negate the benefit of a shield, negate dexterity bonuses, and are made at +4 to hit. Concealment: Concealment is anything that obscures an opponent’s vision, such as tree limbs or smoke, but does not physically block incoming attacks. The GM must decide whether the defender is about a quarter (-1 to AC), half (-2 to AC), three-quarters (-3 to AC), or nine-tenths (-4 to AC) concealed. Will goodness and valor prevail, or will Gulwar and Dravin's idiocy foil the party to its doom?